The Easi-Place machine has been designed to combine DVD/CD trays with their backing folders, placing up to six trays in one operation. The unit is comprised of a cast iron framework supporting the conveyor system, timed belt feeder, a 12 head hot melt gluing system, and gravity feed tray placement system and indexing delivery table. The timed belt feeder is designed to handle up to a 7-panel carton. 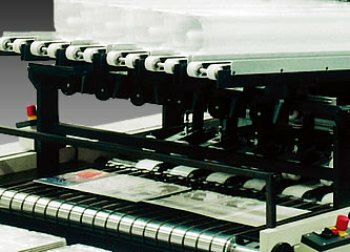 With the addition of change parts (included) the machine is able to run 2 streams (any combination of 7 panels), 3 streams 2 panel (optional extra). The hot melt gluing system is kept totally separate from the main operating system for ease of maintenance and troubleshooting. The glue controllers are mounted in an accessible area adjacent to the machine control panel and the glue tanks above the carton feed area. 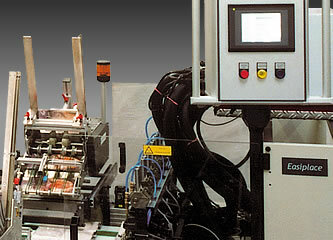 DVD trays are fed into intermediate tray magazines mounted above the conveyor. 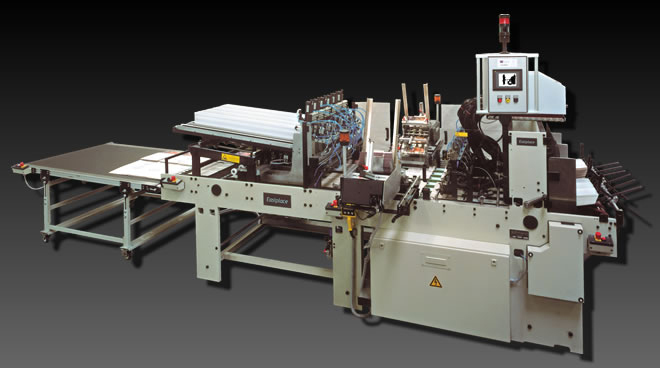 The magazines can be adjusted utilizing manual winding mechanism to suit the size of the carton tray panel. The fixed pushers on the conveyor will carry the carton from the deposit position of the feeder, past the gluing station. The pushers then push the DVD trays out of the intermediate holding position onto the pre-glued card, where they are pressed down with a roller. Completed units are then fed onto an out feed conveyor that can be set either to ‘feather’ or stack the product ready for packing. 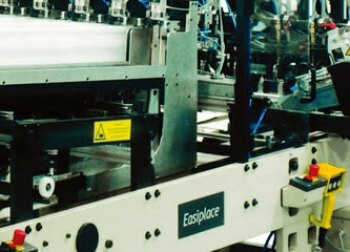 The machine design incorporates as standard features, ease of set-up, and quick changeover times from one job to the next, simple operating systems, and these design features lead to substantial cost savings in initial outlay and daily operation compared to existing machines on the market. This machine has been specially designed by Concept Finishing Services in the UK and we believe it to be most advanced machine available. Input and reading of machine and production data (including hot melt system) via touch screen monitor. The transport of the cards is done by 6 tooth timing belts, fitted with carriers. The main drive is via by the drive shaft of the squaring section. For every tray (max. 6 ) 4 glue dots are applied to the card by 2 glue nozzles. Each pair of glue nozzles can be switched on or off separately. Operation with one (1-lane operation) or two (2-lane operation) light sensor is possible. There are 6 inclined pairs of toothed belts holding the stacks of DVD or CD plastic trays. The feeding motion of the stack is via a pneumatic cylinder, which increments the tooth belts forward via a ratchet mechanism. The level control for every magazine is via a light sensor. The length of a tray magazine is 1400 mm. A pneumatically operated clamping device holds back the stack of trays when the front one is picked off. The clamping device is accurately adjustable in feeding direction to ensure that only the first one is free. The pick-off device is the limit stop for the tray stack and is fitted with two suckers to pick off the front tray from the stack. After being picked off the tray slides to the waiting position. Spring plates stop the tray and adjust it sideways while it is transported by the carriers. The card runs closely underneath the tray while the carrier takes the tray flush with the rear edge of the card. At the end of the slide way the tray lays on the card and is fixed by a pressure roll. The completed units fall on a delivery table where they are transformed to stacks of 5 to 10 units. The machine is fitted with a rotary encoder. One rotation of the encoder corresponds to 320mm of machine travel. After switching on the timed belt feeder the cards will be conveyed onto the transport tooth belt. A light sensor triggers off the glue application, if no card is present, there will be no glue application. Data input for glue application is done at the control monitor. Signals for the pick-off process are by light sensor. If there is no card, there will be no pick-off process. Clamping cylinder moves downwards, clamps tray stack with the exception of the front one which touches the limit stop and the suckers. If light sensor for level control of the tray-magazine indicates an empty magazine, there will be an acoustic and/or optic signal to identify empty lane to machine operator. Setup times between production runs is approximately 30 – 60 minutes depending on the product being handled. All necessary electronics and electrical components are supplied in a separate cabinet. All logic controls is PLC based; all other control is by programmable modules. All wiring is numbered to assist trace ability. To ensure that the equipment is suitable for virtually any environment, stainless steel components are used extensively. These would normally include shafts, rollers, guards and all fasteners. There are a few greasing or oiling points and a routine preventative maintenance program is specified in the machine manual. An inexpensive service contract facility is available to help reduce unscheduled production down time. Electrical: 230 60 V 3 Phase / 30 AMP Circuit. For the USA we suggest NORDSON PRO BLUE SYSTEMS with H-400 MODULES for the best results and outstanding technical and customer service.